Several weeks ago I came across a sealed vintage bottle of 4711 - Echt Kölnisch Wasser at a local fleamarket. Impressed by its voluptuous cut-glass flacon, I snapped it up for less than a latte. One of the worlds oldest and most recognized brands of cologne, it seems at one stage or another, everyone's great aunt, grandfather or big brother once had a small bottle of this elixir stashed in a draw or standing on a dresser. Zesty and herbaceous, 4711 has stood the test of time, and besides being an all-purpose refreshing splash for more two centuries; has become a design icon in its own right. The ornamental gold and blue-green label is extraordinarily eye-catching, and if you visit the 4711 website, you'll note its contemporary appeal. Imagine my surprise then, when I learned via an email exchange with a contact at HQ in Köln, that my fleamarket purchase is likely to be of a 70 year vintage. 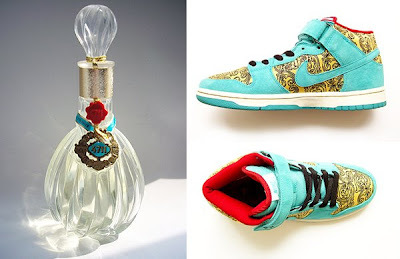 Whilst Nike shoe designers borrow inspiration from Echt Kölnische Wasser for their 2007 retail season, (and charge $170.00 a pair), I can't help feel blessed somehow that I stumbled upon a 150ml 1930's original... for a measley $2.00. I don't have any at the moment, but I absolutely love 4711 - my best friend bought me a little bottle, and the we shared a huge,inexpensive bottle when we were roommates. We bought it at Wanamakers in Philadelphia when there used to be a neat sort of apothecary within the store, with old-fashioned shaving things and the like. The scent is very fleeting on me, however. Yes, in true cologne-style, 4711 does tend to disseminate rather rapidly. I think part of its success is its accessibility and price point, and those large 500ml, 600ml and 800ml bottles mean lots of liberal application! I've learned recently that there is a cologne fountain at the HQ in Köln... now that would be truly something to behold.